It seems like lately I have been discussing ear infections A LOT. It is true that I am a pediatrician and that one of the most common things I see in clinic is, in fact, Ear Infections. So lets take a few minutes and go over some basics about Ears and Infections. And then lets discuss prevention and treatment. Stay with me. It may get boring at times, but this information can help you avoid future copays. As the discussion about the diagnosis and implications of ear infections commence, I see parents wondering about the treasures and hidden tidbits that hide in their children’s ears. Tidbits that they barely understand, cannot see, cannot touch, or capture on iPhones. This sums up the main ingredients creating the parental nightmares. Many mom’s search on amazon for Otoscopes so they can better understand this secretive organ, the Ear. Let’s discuss! infections occurring in the Middle Ear, which lies behind the Tympanic Membrane or the Ear Drum. Note: Water from the pool, showers, bath tubs can get into the ear canal, but cannot get past the Eardrum. This is a sealed membrane that protects the middle and inner ear from the outer world. Thus, one cannot get a middle ear infection from swimming or bath tubs. have you noticed that kids seem to get lots of ear infections, while adults do not? if you have ever wondered why this is, here is a simple schematic. If you don’t care, you may be looking at the wrong blog post. the arrows point to the eustachian tube, which in kids is shorter, narrower, and flatter than in adults. This is where genetics play a role. Parents who had tons of ear infections as youngsters, are likely to pass on flatter and narrower eustachian tubes to their offspring, which in turn may lead to lots of ear infections during childhood. 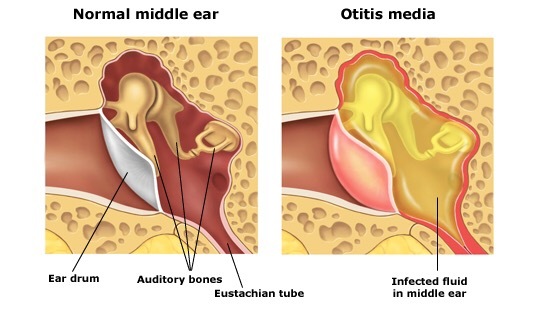 as children grow into adults, the eustachian tubes enlarge and start angling down, which leads to better drainage of the middle ear, thus less infections. the following schematics illustrates how the eustachian tube is connected to the back of the throat and where it drains behind the nasal passages. Our bodies make fluid in the ears, eyes, mouth, and so on, daily, to keep cells alive and things working smoothly. Extra fluid drains from the middle ear, down the eustachian tube, down the back of the throat, no big deal. This happens all day long. All is well when there is no swelling or boogers. leading to fluid build up in the middle ear. Ex: fluid which is not infected from congestion, colds, sinus infections, allergies. Fluid can build up within minutes to hours in the middle ear. 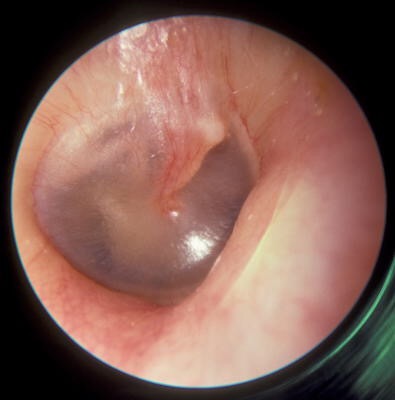 There are some other reasons for eustachian tube dysfunction, but that is beyond the scope of this discussion. leading to pus. When fluid is trapped in the middle ear, it creates a dark, moist place, where bacteria loves to reside and cause ear infections. Pus and infection can occur within 12-24hrs. Yes, that fast! It is very frustrating. Your doctor did not miss it or misdiagnose it. Colds, allergies, passive smoke exposure, reflux, and snotty noses cause inflammation in the nose, adenoids, and/or tonsils. This swelling blocks the Eustachian tubes. Furthermore, all the congestion, reflux, and mucous cause a back up of fluid into the Eustachian Tubes, providing the perfect environment for bacteria to take up residence and cause an ear infection. Day Care and older siblings create exposure to lots of colds, thus lots of snot. Family History contributes short, flat, narrow eustachian tubes that can easily get clogged, swollen, and blocked. Pacifiers introduce all kinds of germs and bacteria to the back of the throat. 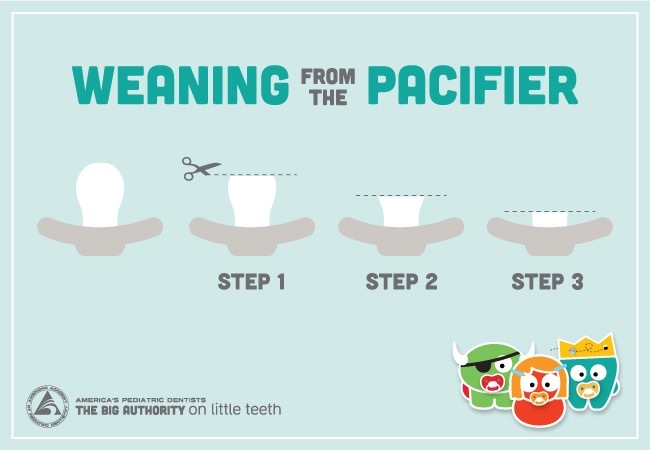 Pacifiers are petri dishes full of bacteria and viruses (yes even those used only at naps and bed time). When a child inserts a pacifier in his/her mouth, the bacteria/viruses travel to the back of the throat and move on up the eustachian tube. Guess what happens next…….. Taking a Daily Probiotic – VSL3 is my Fave (Costco or Sam’s Club), or get one with 6 or more types of bacteria and over 10 billion colonies. No, yogurt is not enough. Study linking probiotics to decrease in illnesses in day-care children. Probiotics build up the immune defense in your gut which is connected to the back of the throat, nasal passages, and middle ear. Thus a stronger army is located in strategic places to defend against the enemy: viruses and bacteria. Food allergies may play a role in recurrent ear infections, so speak with your doctor about elimination diets, how to do it, how long, and if your child is a candidate. Food allergies have been shown to be linked to recurrent fluid in the middle ear (serrous otitis media). Elimination diet of the offending agent can decrease build up of fluid in the middle ear, which in turn can reduce the risk of ear infections. Prevnar Vaccine has been shown to decrease the risk of ear infections – this pneumococcal vaccine is administered at 2,4,6,and 12 months of age. Get it done! Echinacea (Echinacea purpurea) has not been studied in the treatment or prevention of ear infections. Some physicians may recommend this however. If you are allergic to ragweed or pregnant do not take this herb. Nasal Steroids – such as Flonase, Nasacort, Nasonex – Have been shown to decrease swelling of adenoids, nasal passages, and sometimes tonsils in those with allergy symptoms and in some children with snoring at night. Speak with your doctor if this is right for your child. Xylitol has been shown to reduce ear infections, however, I do not recommend it because it must be given 5 times a day to be effective. Kids can barely brush their teeth 2 times a day. Enough said. Antibiotics are used to treat ear infections in those less then 6months old. The Academy of Pediatrics recommends Watchful Waiting for 48-72hrs in those children over 6months old who are not very ill, do not have no chronic medical problems, do not have a ruptured tympanic membrane, or do not have a clear infection. pain can and should be controlled with Ibuprofen for 48-72hrs as needed. Ibuprofen is a potent anti-inflammatory. 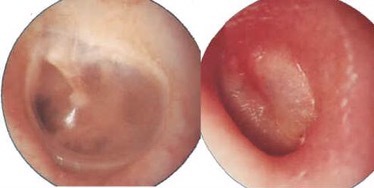 Remember that the eustachian tube is swollen and the middle ear is full of pus. If swelling is decreased, the eustachian tube opens, and pus/fluid will drain out of the ear in most cases. Pain from ear infections is caused by the pressure build up in the middle ear. rinse the nose with Saline Spray and suction boogers. Keeping the nasal passage open will help with drainage from the ears. If ear pain does not resolve in 48-72hrs or it becomes severe despite management with Ibuprofen and nasal irrigation, then antibiotics are recommended. Herbal ear drops (calendula officials, Hypericum perfoliatum, Verbascum thapsus, Allium sativum) have been shown in few studies to help relieve pain. Do not use oily ear drops the day of a doctor’s appointment because it will obstruct the view to the ear drum. I do not use these in my medical practice at this time due to lack of medical evidence. 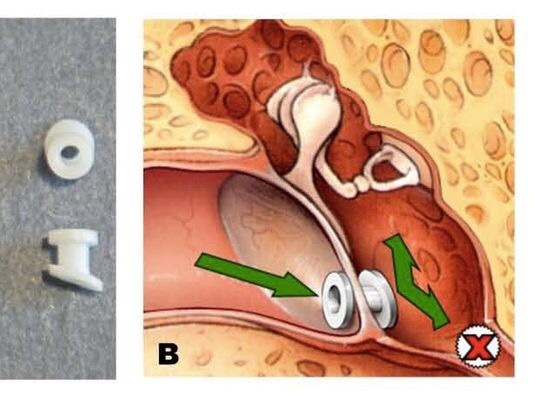 Tympanostomy Tubes (Drainage Tubes) are used to treat recurrent ear infections, resistant ear infections not responsive to antibiotics, persistent fluid in the middle ear that is interfering with hearing and speech. tubes do not eradicate ear infections, they generally decrease the rate of ear infections by providing drainage of fluid from the middle ear into the ear canal. Furthermore, tubes are a path of antibiotic drops to travel to the middle ear and eradicate the infection without the use of oral antibiotics. References not otherwise mentioned within the article.